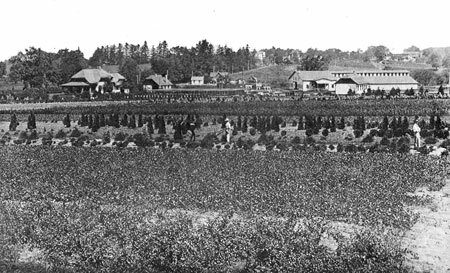 In 1911 William Flemer, Sr. began purchasing properties at Mapleton, south of the recently completed Carnegie Lake, as a site for his wholesale nursery. During the succeeding decades, Princeton Nurseries has grown into the largest wholesale nursery in the world. William Flemer, Jr. here describes the history of the firm and the land it conserves. 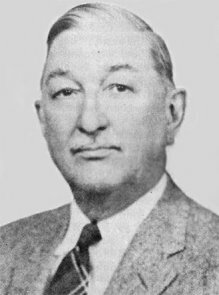 Commencing in 1910, William Flemer, Jr., and his father searched along the East Coast for a propitious site for their wholesale nursery. Due to the richness of the soil and the proximity of railroad and canal facilities, they settled on the broad acres at Mapleton, South of Princeton, where they purchased several properties. By 1924 the landscape had already been transformed, as evidenced by this view and the selection of photographs on the last page, recently rediscovered in the Rose Collection at Firestone Library. "I have always been interested in local history, not only Princeton's but Kingston's as well, where our nursery and my home are located. My father, who had the F & F Nursery, located in Springfield, Unicn County, New Jersey, decided in 1910 or 1911 that the area was building up so rapidly that it would be necessary to look for a new nursery location. We spent two years visiting Long Island, Pennsylvania, Maryland, the Eastern Shore and, of course, New Jersey. After two years of study we decided the Princeton area would be best suited for our purpose. "The area was located halfway between New York and Philadelphia and also Boston and Washington and was close to the main line of the Pennsylvania Railroad. Since at that time all transportation was either by rail or boat, we at first wanted to purchase on both sides of the Princeton railroad branch, but were told that that belonged to the University and they were holding it for the protection of the campus. So we decided to locate in Kingston on the Rocky Hill branch of the Pennsylvania Railroad. Also, it was near the Delaware and Raritan Canal, which was in full operation. "The Rocky Hill branch of the railroad was part of the original railroad in New Jersey, called the Camden and Amboy. And when Abraham Lincoln became President he left New York and went on this railroad to Camden, and then by boat over to Philadelphia and then down on the Baltimore and Ohio. About ten years ago they closed the Rocky Hill branch, but now they are going to put it back in service to haul the stones from the traprock quarry. But this railroad, which followed the canal down to Trenton, had quite a history of its own. "The soil on our property was a very fine Sassafras loam created during the age of the glacier. The glacier is said to have stopped up in Rocky Hill, near where the quarry is located. When we bought the first farm there were great big rocks on the property; they had been ice-rafted. Further along, going southwest, there were smaller stones, but on the greater part of the property there was nothing but very fine soil. 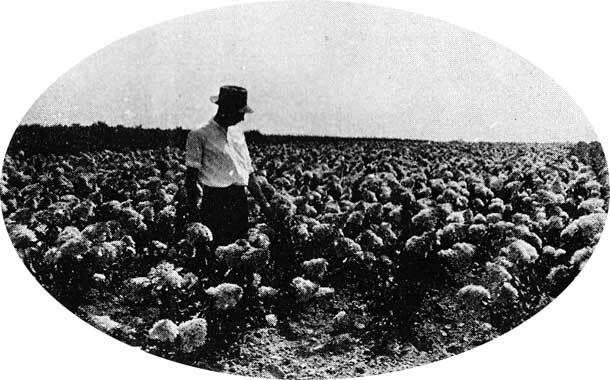 "The first farm of some sixty-five acres was purchased from the Myrick family, at a cost of $9,000, in September 1913. A doctor lived there who had a son in Princeton. The original house is still there. And the barn used to be our horse barn, but, of course, we don't use horses any more. "The next adjoining property of sixty-five acres was purchased from Johnty Higgins in 1914 at a cost of $14,000. That is also just the way it was. We later converted the wagonhouse there into a home. I planted oak trees around the place when I first moved down here in 1914; they're very large today. "Following that, the next adjoining property, the old Van Dyke farm, was purchased from Emerson Pullen. It consisted of eighty-five acres and the price was $12,000. The last property, West of the first purchase, was bought from Alexander Gulick; it had been known as the Archibald Gulick property. It consisted of seventy acres and the price was $11,500. These four connected purchases totalled two hundred sixty-five acres at a total cost of $46,500. As each property had good buildings, fine soil, and access to both the railroad and the canal, it made a very fine setup. This amazing inclusive study of a typical eighteenth-century farmstead (above), included in our purchase of the Schrader Collection of negatives, seemed to defy identification. To our astonishment William Flemer had his own faded copy, signed by Rose in 1876, depicting the Van Dyke house of Mapleton in the time before the removal of the kitchen wing, barns, spring house and "slave quarters." The Rocky Hill branch tracks, part of the original Camden and Amboy railroad, passed near the first of the nursery buildings (below). 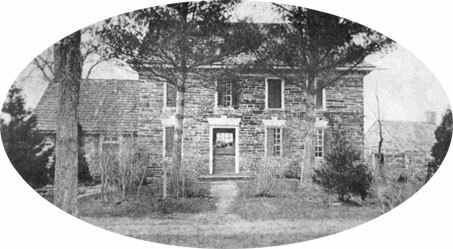 "In going back over the past history of the property, the Emerson Pullen purchase of the Henry Van Dyke farm was the most interesting. Van Dyke was a Dutch settler, and like many who drifted through New Jersey from what was then New Amsterdam, he acquired some two thousand acres. The house we live in was begun by him in 1742. 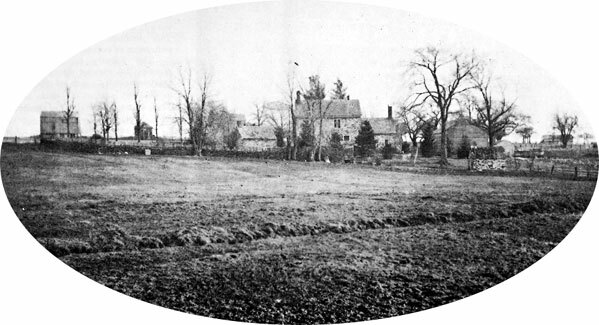 Although Royal Rose made this photograph of the Matthias Van Dyke house in 1876, the building's appearance had been little altered when William Flemer, Sr. purchased the place in 1915. The kitchen wing to the left (now destroyed) was the earliest part of the house, built in 1742, according to tradition. The small detached structure to the right was known as the "slave quarters" and may have been the settler's first home. The central body of the house, complete with Dutch door, still bears scars of British cannon fire and carved signatures and dates as early as 1777. "An interesting sidelight in the history of the house was the fact that Van Dyke belonged to the Masonic Order. While the American Revolution was developing, the leaders protected themselves by the Masonic Order. Gen. George Washington was a Past Master of a lodge in Virginia, and many of the other leaders were either Past Masters or strong members of the organization. The English Crown heard about the meetings of the Lodge and passed an edict that no more than three people could meet after six o'clock in the afternoon. This was definitely aimed at the Masonic Order. So, in order to continue their connection and protection of the members they gave up their meetings in their Masonic Temple and met at the homes of the various men around the Princeton area. Our house was one of the meeting places. "The Masonic room in our house is upstairs. It retains the original chimney breast, with the fluted pilasters typical of Dutch houses of the day. The original corner cupboard, now removed to the living room, was presumably used to keep the ritual implements for the meetings. We also have the only door into the room, which has a small peephole so they could identify the men as they arrived. "And then when the meeting was over, by word of mouth they agreed on where the next meeting was to be held. One of the other meeting places was up on the other side of the lake in a house called Mayberry Hill. They were scattered around so the Tories could never catch up with them. When I first joined the Lodge here in 1924, there was a dentist by the name of Stevens who told me all the historical background, as he had made quite a search into it. "When we bought the house the floors were of red pine that was grown in northern New Jersey and New York, floated down the Delaware on rafts, milled in Trenton, and then brought up here by wagon. They were all of heart wood, deep red. Father had the old floor covered with oak, but after I suffered a fire I had that replaced again with red pine from Maine. "The oldest part of the house, as we purchased it, was the kitchen, which was three steps down from the main section. It had a fireplace which must have been ten feet long and four feet wide, where they did their cooking. The walls were stone, two feet thick. The stone had been quarried on the western part of Van Dyke's land right over where St. Joseph's College is today. They called it "Princeton stone." It was laid up in clay mud, and then when it was finished they cemented up the exposed joints with a limestone mortar. "When we bought the place the roof had leaked in that kitchen wing and the back wall had frozen and bulged way out. I went off with with the Army in France at that time, and I didn't want my father to monkey around with the house until I came back, but by then the damage was done. Father wrote me that he was going to repair the house, but I realized that he didn't have the same love for antiques that I did, and I asked him not to do anything about it. But he went ahead by himself and tore down the kitchen wing and also the old stone slave quarters, which was at least as old and interesting. "You see, when the United States entered the First World War under the leadership of President Woodrow Wilson, I decided to volunteer and joined the Princeton University Ambulance Corps, SSU-523. All the universities, in addition to Princeton, contributed sections, and, in fact, some of them, such as the University of Pennsylvania, had two groups. "Our section was organized in Princeton by Professor Root of the university faculty on 4 June 1917. Practically all the first members of the section were men from Princeton or its surroundings. The group arrived in Allentown, Pennsylvania, on 9 June. There we were trained and taught to drive automobiles until 23 August, when we sailed from New York on the White Star Liner Baltic. The ship arrived on 25 August in Halifax, Nova Scotia, where we stayed for ten days awaiting the next convoy to England. "We arrived in Liverpool on 15 September, went by night to Southampton, where we stayed in an English rest camp, and then sailed to LeHavre, arriving on 17 September. We then went by train to St. Nazaire and arrived on 20 September. There we assembled our Model T Ford ambulances and drove up on 13 October to Sandricourt, Oise. On 17 October we drove to Dormans, Marne, and finally on 18 October to our headquarters at Bussy-le-Chateau, Marne, near Paris, where we were attached to the 35th Division of the French Infantry. There were thirty-eight men in our group, of whom three were killed and three captured. "After the Armistice, our French division became part of the army of occupation stationed near the Rhine at Sausheim, Alsace. We stayed there until we were relieved on 6 March by a younger group. We left Sausheim, went to our base camp in Ferrier to turn in our equipment, and then went by train to Brest where we went through the de-lousing process. Finally, we sailed on the General Grant-- which had been an old, slow, German freighter. We landed in Hampton Roads and went by ferry to Camp Lee, Virginia, where we were mustered out on 6 April. Many of the members received citations. "The group was made up of a very fine, outstanding lot of men who had a great spirit of camaraderie. It was considered one of the finest of the ambulance groups. The men from the Princeton area that belonged to the group included Furman J. Blackwell, Jessie S. Clayton, Joseph R. Dennen, William Flemer, Jr. (Kingston), Leavitt B. Hoffman, Harold E. Hunt (Hightstown), Alexander Kurkjian, Willis McClenaghan, William O. Snyder, Edward A. Stevens, and John R. Gulick. "Kurkjian's brother had a big garage in Princeton, and before the War he worked there. They asked him to join because they thought he was a good mechanic, but he wasn't too hot! Many of the rest in the unit were Princeton University men. Stearns was over at the Graduate School; Second Sergeant Lee was a member of the Class of '16. We got together for years after we returned, at Commencement time. A lot of the men would come back to Princton anyhow, and so we would always meet at my house to have luncheon, then go over to a University game, and have dinner at the Nassau Tavern. "In 1918, while I was in France, my father built our office building, or had it built. I rebuilt it about ten years ago, adding a slate roof and various other improvements. Most of the other houses and buildings on the nursery property are in their original form. In fact, the Mapleton area now owned by the nursery has changed very little. The main houses are original, or old homes reconditioned. "One of the earliest owners, Matthew Van Dyke, initially owned a couple of thousand acres. He had a fairly large family, and as his sons grew up he gave them farms. The oldest son, William, married and was given a two-hundred-acre tract on the East side of his father's land. My son, William, lives there now. And that house is where they used to send the boys from the University for correction. The family that lived there at that time was connected with the University. That house was originally just two rooms on the first floor with a big fireplace and a bedroom overhead reached by a circular stairs. And then about 1820 the larger section was added. "Another son, Henry Van Dyke, was later given a tract to the South, which covered the area now owned by St. Joseph's College and the Forrestal property. St. Joseph's came here soon after the nursery in 1816; the Rockefeller Institute of Medical Research soon after. "When I got back from the War I also started purchasing adjoining properties until our total holdings were about twelve hundred acres. Wherever possible I bought both the property and the house. So I acquired quite a few older houses; and then we built quite a lot, too, for the help. Today there are about twenty-five houses in all, and the employees rent them out. Some time ago I had the idea to paint them all the same color, and now they are all colonial yellow with white trim, which stands out quite well against the nursery fields. "When we bought the first farms, they were mainly in fields, but there were also big hedgerows, which we had to take out. To protect the fields we planted poplar windbreaks, which are replaced from time to time. The idea of the poplars came from France. In the Rhone River valley they have very strong winds coming down from the North all the time, and they use poplar windbreaks every so often in opposite directions. "I also planted rows of sycamores along the roads after I got out of the Army. They are sixty years old now and quite enormous. That, too, is a common feature in France. A lot of the roads there were built by the Romans for their armies. Before automobiles and trucks the soldiers had to march on foot, so they planted avenues of trees to keep the sun off the soldiers in the Summer. And when we got to France, as long as the trees were full of foliage, the German aviators couldn't see us. It was only during the Winter when the leaves were off that they shot. "Even though the canal has been out of operation since the early 'thirties, we take much of our water for irrigation from it today. Years ago we installed a very efficient irrigation system by purchasing a pipeline given up by the Sun Oil Company. But for drinking we use our own well water, which is of very good quality. I put the water system in for the nursery in 1932. The tower is 125 feet high with a tank of 75,000 gallons, and the mains are all cast iron. At the time I got approval from the fire underwriters that if I put in the system, they would cut our insurance down to just a fraction of what it had been before. I also developed the Kingston Water Company, providing water not only for the nursery but for the village of Kingston as well. "During the War, when I was driving the Model T ambulance, most of my duty was more or less mechanical, except when we were travelling under shell fire or at night. During the intervening quiet periods I concentrated on just how the nursery would be developed when and if I returned. I decided to departmentalize the operation into separate areas, such as the greenhouses, and the seed beds, and the like, each with a man in command and a subordinate to succeed him, so in case he died or went away we would be able to continue. This would avoid conflict and provide a much smoother, more efficient operation. When I returned these various operations were put into effect. "Even at that time I sensed the need of increased mechanization, and while in France I began to plan labor-saving equipment. Back here in my workshop I had all sorts of tools - a lathe, bandsaw, planer, and the like - so I made the original prototypes for much of this new equipment. We still make our own specialized devices with our own mechanics. "We have a tractor, for instance, which has a semi-circular blade underneath it and a hydraulic lift. With that tractor they can drive right over the tree, let down the blade to cut the roots and form the ball of earth, and then lift the tree right out. That was one of my designs. "Everything is mechanized as much as possible. We have forklift trucks which go out to the fields to dig material, and they put the trees and shrubs on wooden pallets. Those pallets are then assembled with their order under partial cover from the weather. Then they are all loaded onto trucks and sent out to the whole East coast. "I built the first of our greenhouses with a helper, and it went up so easily that I decided to add another one right along the side, sharing one of the longer walls. Then a couple of years later I put two more in. Later I put four more on the other side. Now there are about fifty of them. William Flemer, Jr., photographed (below) in 1924 surrounded by a field of hydrangeas, spent many hours of his off-duty time as a World War One ambulance driver planning the labor-saving equipment and procedures, which were to revolutionize the nursery business. He built the first rows of greenhouses himself. "Many of our greenhouses today are not heated at all. We use a structural framework covered in polyethylene, and keep material in them all Winter. It's a strange phenomenon that plants can stand a good deal of cold, but they cannot take the rapidity in nature with which they get frozen and then thawed out again and again. "Another interesting facility, which I developed, is called a lath house. The floor is sloped with the roof parallel to it. Half the roof is made up of narrow aluminum gutters, the other half is open. And then there are automatic sprinklers that we can turn on to water the plants which are kept there. The one advantage that I didn't realize when I designed that roof of aluminum is that the temperature in there on a sunny day is ten degrees cooler than it is in the open. "To bring the matter up to date, in recent years we started to buy land near Allentown, New Jersey, where we now have some four thousand acres. Our work force now consists of about one hundred and fifty Puerto Ricans and about the same number of local men. We supply wholesale plants all over New England, as far South as Washington, and as far West as Chicago. Besides being the largest nursery in America, and, in fact, the world, we are the most mechanized, developing many of our ideas ourselves and making them in our workshops."